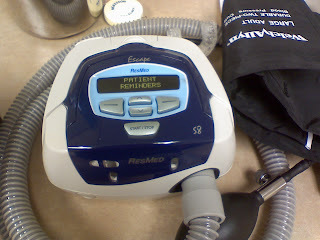 Brown Brown: The Shrinking CPAP! CPAP devices have decreased in size and increased in efficiency since I got mine about 5 years ago. My CPAP machine is getting old, tired, and doesn't function quite well. I saw the Sleep Study specialist this morning to get a prescription for a new one. Now, I hope my insurance will approve and cover most of the cost! I should find out later this morning. My new machine will be the model as seen in this image.